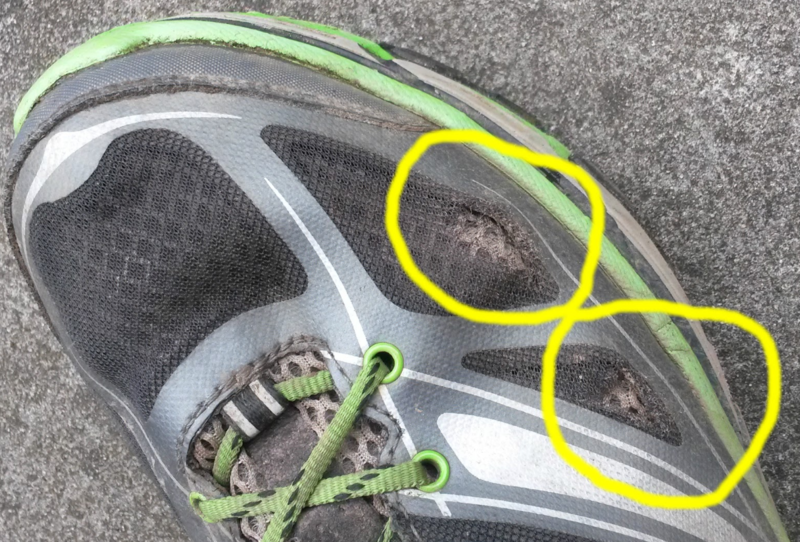 I love my Hokas (and I have spotted many other club members who also seem to love their Hokas), but they are not quite perfect for me. I have been running in Hokas for a couple of years, and can confirm that they do provide superb cushioning, and seem to have helped to reduce my injuries, including hamstring and knee complaints. However, Hokas are not always the most comfortable on the feet. Recent variants seem to employ narrow, restrictive uppers to the shoes, which can become uncomfortable when running even short distances. This narrowness also manifests itself in upper shoe failure (see below). So could I have all the benefits of the Hokas maximal protection and ultra-running pedigree, but in a more comfortable shoe? Oh yes. The Altra (from USA) range of shoes have been developed to perform like Hokas, but have a wide foot-shape toe box providing a pleasant 'shoe-on-foot' experience. In addition, they are all zero-drop (the stack offset from heel to forefoot) which is supposed to promote better running technique (once you get used to it). In 2015, I tentatively purchased a pair of Altra One's primarily as a pair of race shoes (replacing some old Brooks Green Balance). These shoes have the smallest amount of cushioning in the range, but as soon as I put them on and started running I knew that they had been a good choice. I have since used them for racing and training on track, road, trail and gym. I was so impressed that I purchased one of Altra's trail shoes, the Lone Peak 2.5. This too is a very comfy shoe and is being used currently for trail-based Parkruns and training. 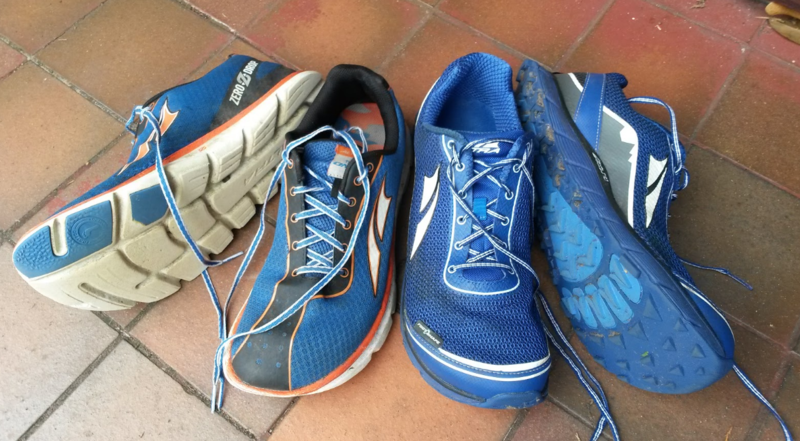 The Altra One is the most comfortable shoe I have ever worn (full stop). It is light, flexible and pretty grippy on most surfaces (despite being marketed as a short distance road shoe). PS Since I wrote this original article, I have now also purchased a paid of Altra Torin 2.5 road shoes. They are very similar to the Hoka Cliftons, but more comfortable for me due to the wider toe box. Completed my first 5k Parkrun with no problem, despite being injured with an upper hamstring tendonitis. Warning : The wide toe box of these shoes are great, but I think it leads to your foot expecting the same room in other shoes; as it readopts its true shape unconstrained. Therefore, your old shoes may become a little painful.